City Econo Guesthouse – cheap, centrally-located and comfortable. Here’s the first of my many posts about my recent vacation in Hong Kong. Don’t worry, one of these is definitely the revelation of my PHP15,000 Vacation Challenge as mentioned in my previous post. I will just finalize the tally of the total expenses and I’ll be all set to reveal if I am indeed successful. First, I’d like to give credit where credit is due. 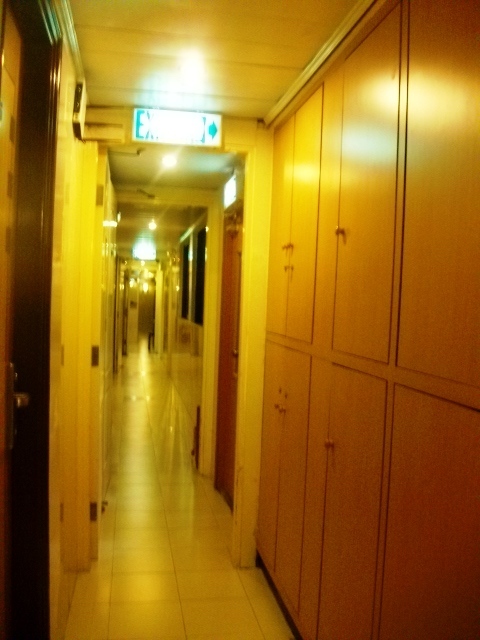 I stayed at the City Econo Guesthouse, located on the 5th and 6th floors of Cumberland House in Nathan Road, Tsim Sha Tsui, Kowloon — exactly parallel to exit C of the Jordan Station of the MTR. I found the guesthouse during a harried, lodging-scouting period where most of the boutique hotels and guesthouses were booked due to the October conference month. Tired after being rejected by about six accommodations, I quickly searched PinoyExchange and found it as one of the recommended places by Filipino budget travelers. I fired a quick email to Jenny, the property owner and received a prompt reply the next day. Suffice to say, I was able to book the room without any deposit, but with strict instructions to confirm reservations three days before the trip.Email correspondence with Jenny is very quick and efficient–hence, I honestly don’t think you need to pass through a third-party agent. We were given instructions to take the A21 Cityflier bus from the Hong Kong International Airport and alight at the Prudential Centre stop, roughly the 11th bus stop from the airport. The hotel is just across the road. I recommend you take the back entrance (along Bowring and Pilkem Street) to avoid the narrow and steep stairs facing Nathan Road. Upon check-in, go directly to the 6th floor and look for Jenny who will assist you during the whole check-in process. You will also be asked to settle the entire bill during check-in. The rooms were basic: clean, comfortable and safe — just what we needed after a long day of sight-seeing. We really didn’t stay much indoors. We are pretty much out of the room by 9AM, only to return by 10 or 11PM. We were tired, cranky and just ready to sleep. City Econo Guesthouse provided us what we need minus the frills and without the hassle. Double Room for mum and dad. Our room was just across the hall. our spacious quadruple room and with the equally spacious bathroom. and these three are my constant room mates! We were given six bottles of free mineral water upon check-in, but these were not replenished during our four-day stay. Didn’t bothered us though because we also decided to stock-up on water following a visit on the supermarket located at JD Mall. 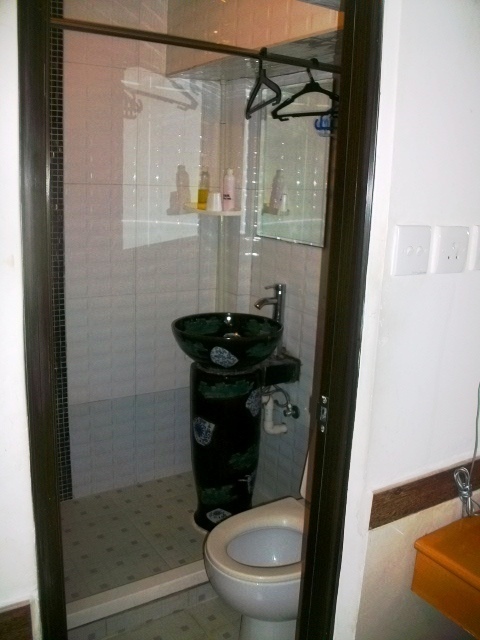 The room was roomy and airy, did not smell that old building smell (common on guesthouses) and seemed newly renovated. Wifi was free but spotty, plus there’s also telephone and working TV (with 4 channels only). At noon (most likely) someone comes in to tidy the place, throw the thrash and replenish the tissue paper inside the bathrooms. There were also shower gels and shampoo provided, as well as towels which are freshly changed everyday. Now for some obvious realities: the building being old, we noticed that the tiles inside the bathroom were fixed (it showed) and the cracked ones repaired (it showed). The shower curtains were also old, but still does the job (and it didn’t smell) plus there’s hot water available for those who hate cold showers. Being a family-run establishment, you can sense the care and the sense of dedication of its owners. After we have checked in, Jenny dragged her son to change the light bulbs inside our room and have it checked to ensure all things are in order. Jenny and her husband, along with their son, handle the day-to-day operations of the guesthouse. They are quick and efficient, hospitable yet professional. They also offer tours and tickets to some of HK’s attractions. In fact, we were able to buy Disneyland tickets at City Econo Guesthouse at HKD20 off. Talk about savings! One of the best things about City Econo Guesthouse is its location. It’s right beside exit C of the Jordan MTR and smack at the middle of Nathan Road in TST. Located on the next street is the Kowloon Park and directly across Pilkem Street is the famous Temple Street Night Market (named after the temple in the middle of the road). After visiting the Avenue of Stars and the Symphony of Lights, we decided to walk from the corner of Peninsula HK to our hotel. It was just a good four blocks away and about 15 minutes by foot. There were a few “safety spots”, but the rest is simply too overwhelming and bright and fun, considering the many-colored billboard along TST. So, if you’re the type who’s rather spend their hard-earned money shopping than splurging on a hotel room you won’t get to see much anyway, try to consider City Econo Guesthouse. It’s money well spent. NOTE: This is not a paid advertorial. I paid for both rooms during our four-day, three night stay. They do not accept credit cards, please bring cash. One day, while I was having a quick noontime break with my colleagues in the work place, one of them said to me, “You know you must be freaking rich or your salary must be big…you’re always going somewhere eh…” I didn’t know if I should get offended or not. But in my mind, I wanted to correct his misconception. First and foremost, I am not rich nor do I have a trust fund stowed somewhere funding my travels. Second, (and unfortunately) I really don’t earn much from my work as a manager (enough but not too much, I guess) and third, yes I am always going somewhere. I couldn’t blame them. Life is hard, and today’s economic climate does not make it easier. But then, I see them splurging money on night outs an shopping trips and then I ask myself, aren’t we any different at all? I agree that one must save for the future. For that, there should be a savings account or insurance or pension which you know will accumulate benefits for you when the time comes. I also agree that there the basic necessities should be prioritized. 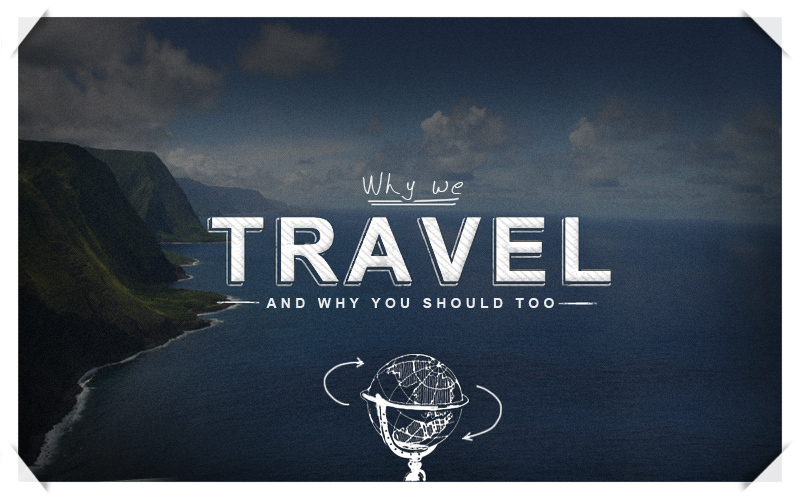 But, what if one of these basic necessities is the need to explore and see the world? For me, I travel because the world is too big, too vast, too pretty and diverse — that choosing not to see it is an abomination. I travel because I believe, that there’s just so much out there that I needed to see it. I always say that traveling has and will always be my escape from the realities of corporate rat race. I have never felt more alive whenever an out-of-town, or an overseas trip is looming in the horizon. The intricacies of preparing a trip, the stress of bringing things together, of planning and haggling and trying to raise money. Allow me to be honest, I am just a lucky girl who always manages to make things fall into place. A cheap flight and an equally cheaper lodging. A few bucks into my pocket budgeted for four days. Eating in holes-in-the-walls and discovering delicious yet sinfully cheap street foods. Hearing a cacophony of languages you don’t understand. Navigating the local train station and learning the ropes. Eating something you never thought you would. Learning a way of life that is vastly different from yours. What can be better than that? I agree, I really should devote more energy and money in making my savings account healthy. In fact, I have decided to assign two accounts — one for travel and the other one for the rainy days. Figured out that the two should never overlap or intertwine at all. When people tell me that traveling is expensive, I just shrug. Yes, it is expensive if you will insist on regular, last-minute rates, stay on five-star hotels and insist on taking the cab everytime. Yes, it is expensive when you prefer fine dining and shopping for things that can be readily available when you get back to your hometime. Maybe indeed, it is expensive. But we all know that education nowadays doesn’t come cheap. 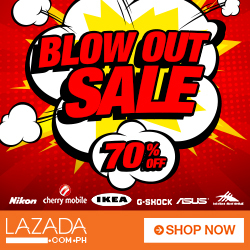 Hong Kong for less than PHP15,000? Let the challenge begin! Will be leaving for Hong Kong on Thursday for our first ever family trip. After careful planning, checking and re-checking of itinerary, I managed to whittle down the budget (per pax!) 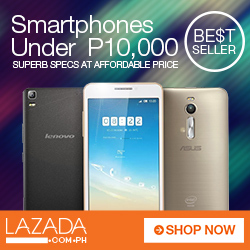 for just PHP7,000.00 (roughly USD169). The budget already includes entrance to Disneyland, The Peak, Ngong Ping 360, food for 4 days, and payment for transportation via the Octopus card. If we are to include contribution per person for the guesthouse and the unfortunate Philippine Travel Tax and terminal fee, I think we can make it. Of course, this does not include the plane fare which was purchased four months in advance from Cebu Pacific for only PH3,500 (return) per person (inclusive of fuel surcharge,etc)! 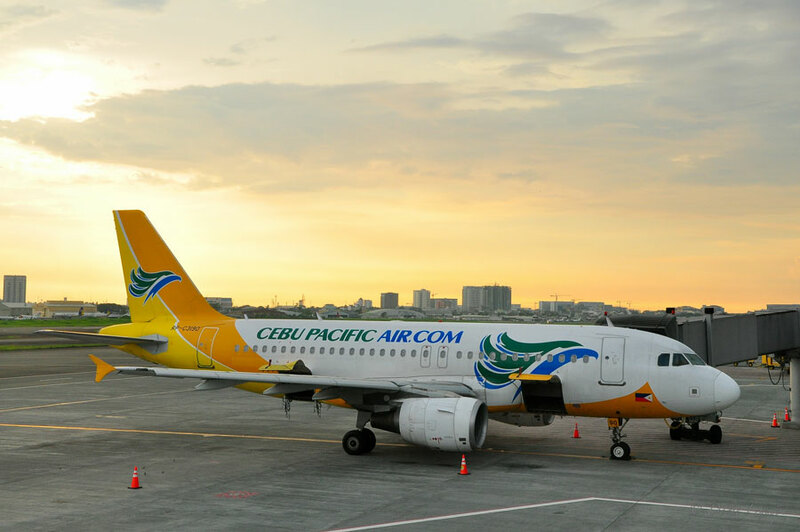 I always ride JetStar or Cebu Pacific wherever I go, maybe because I always travel using heavily discounted tickets. So far, I had good experiences on both airlines. JetStar has efficient but slightly snobbish airline stewardess while CebPac has one of the nicest flight crews around yet their planes are a bit delayed. In spite these observations, I will gladly travel with both airlines any opportunity I get. Honestly, it is through budget fares that I manage to see countries I used to only dream about when I was young. Before, air travel gave a certain vibe that it was only for the managed class, but thanks to the rise of budget airlines, even ordinary people like me get to see new places and experience new culture. The rise of the budget airlines, I must say, also gave birth to the seasoned budget traveler. I love staying in boutique hotels, hostels and guesthouses. In Singapore, I had very fond memories of South East Asia Hotel located in Bugis. The room is clean and comfortable and the free breakfast is filling. The aunties and uncles manning the counter are friendly and not aloof (as mentioned by some in TripAdvisor). And most of all, the room is dirt cheap. Of course, the hotel is old and has seen better days, but it is well maintained as much as a family-owned establishment can muster. In Seoul, Zaza Backpackers is a good place to stay, especially when you want something that is in the middle of the action (Myeongdong) but is strategically located away from the noise. 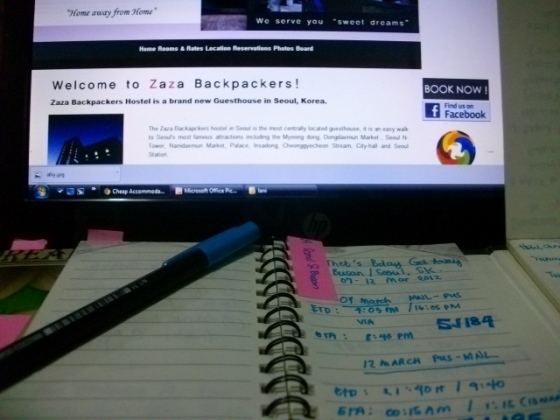 Affordable, safe and clean, Zaza Backapackers is located in a good neighborhood not far from Namsan Tower. 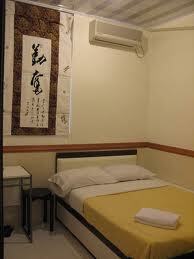 For this HK-trip, I am booked rooms at City Econo Guesthouse, located in Nathan Road in Tsim Sha Tsui, Kowloon. The guesthouse earned rave reviews on Filipino travel sites and well-recommended by Pinoy budget travelers. One of its owners, Ms. Jenny, is lauded for her kindness and efficiency. 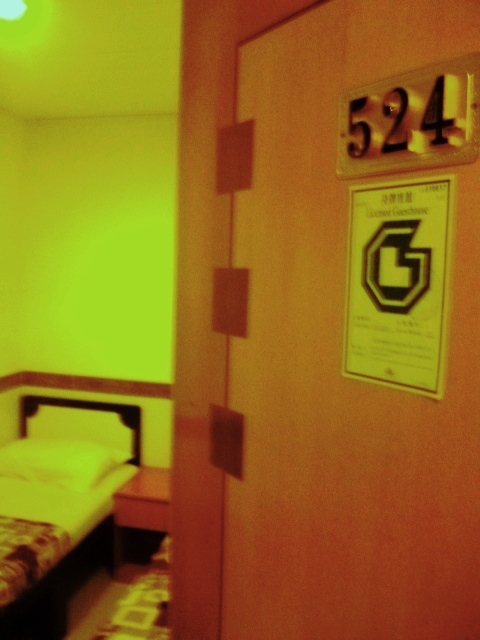 In a place like HK where finding an affordable place to sleep in is like finding a needle in a haystack, guesthouses like City Econo is heaven-sent for budget travelers like me. The best way to know the city is to memorize its public transportation system. This is how we survived in HK, Singapore and Seoul. Always get a saved transportation card where you can always top-up the value. Learn how to read signs and navigate your way around the labyrinth beneath the city streets. It’s fun and an experience in itself. 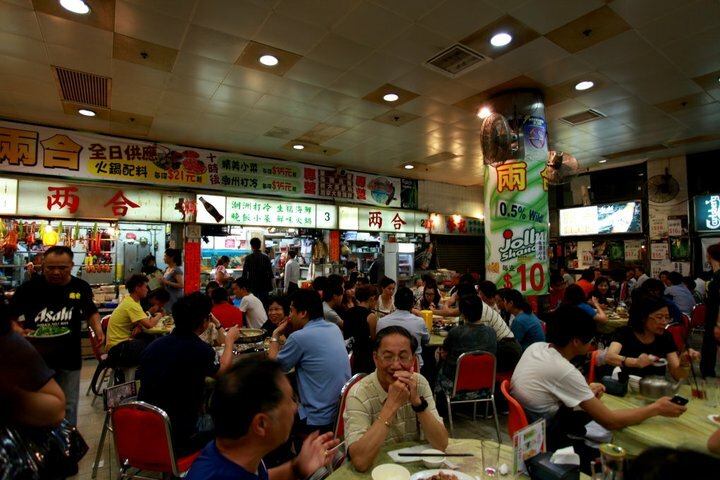 “Dai pai dongs”, “hawker centers” and cheap restaurants — look for the places where locals converge. My brother, on his first trip to the Lion City last year, simply couldn’t get enough of the 2SGD set meal which he finished in one sitting. He loved the explosion of flavors and the fact that it didn’t burn holes in his pocket. Lastly, I really think that you should bring along a good sense of humor and a certain knack for adventure. It also helps when your companions are not kill-joy or too high maintenance, who preferred five-star hotels and Michelin-starred restaurants. I’ll give you a report once I get back if I am successful on this challenge. Will also upload my breakdown of expenses for the four-day trip. ..and oh, if you have tips on how I can stretch this budget (and the cheap places to eat in the TST-Nathan Road area), do drop me a note! Would love to try out your suggestions! In my case, it’s with the simple stroke of a pen right after the tickets have been confirmed and a confirmation of flight has been forwarded to my email address. I have always been the type of girl to search for the tiniest details each time I plan a quick get-away, whether where to sleep, stay or even exchange foreign currency. In our family, I was the type to plot a trip in MS Excel with grids dedicated to itinerary, budge and number of recommended hours for travel and commute. Tedious as it may sound, I find simple joys in looking up attractions, interesting B&Bs, cheap accommodations and even the occasional to-die for restaurant where we can splurge and enjoy a great meal. 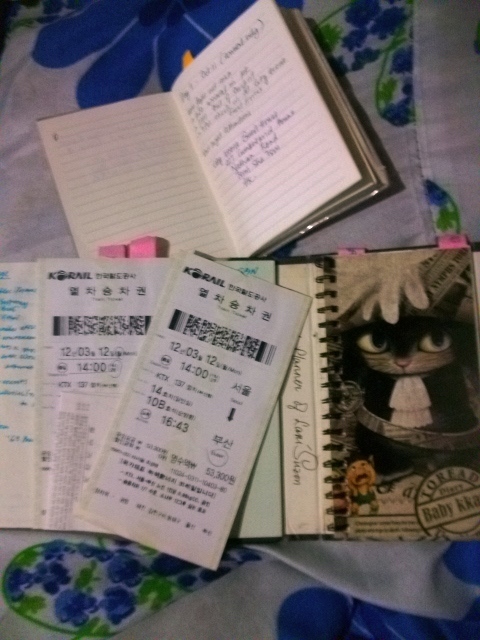 I’ve had three travel journals since 2007. The first one, a thick tome with cutesy shojo manga drawings and barely discernible English quotes, covered my trips from 2007-2009; the second one from 2010 to 2012 and latest one for an upcoming family trip to HK alone. Two of my three journals. The first one (not pictured) contained copious notes about Singapore and HK. From the eyes of a first-time traveler. My second notebook was a thick, black hard-bound rectangle notebook with the picture of a black cat on the cover. Inside was three sets of writing pads which was perfect for quick notes and easy reminders. This notebook served me so well when I went back to Singapore in 2011 and of course, during the Great Seoul Searching Trip. 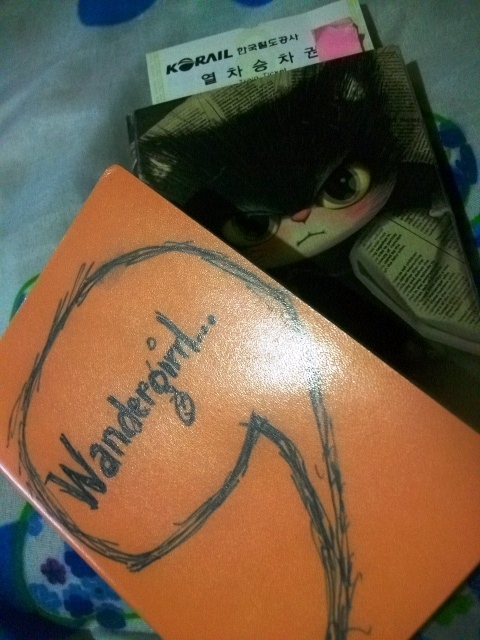 I am currently using a small orange colored Moleskine-type notebook, with the words “WanderGrrrrrrl” drawn in front. I drew this one day during a really slow day at the office. Currently, this notebook contained notes and plans for an upcoming trip next week. The notebook also contained budgets, hostel choices and a few directions going from one attraction to another. At the back, I stapled a small copy of the MRT map in Hong Kong. While I know that maps will be easily available once we landed in Chep Lap Kok, the OC girl in me is happy and at peace with the fact that I have a map stapled at the back of my notebook. This notebook is small and compact and can easily fit my pocket or small day bag. I think this one is perfect when my very dysfunctional-ly funny, but dearly beloved family (mum and dad included!) takes the streets of Tsim Sha Tsui for the very first time. If you will notice in the pictures, there are tabs highlighting the sections: one section was allocated for our first day plans, another one is for the second day and so on and so forth. Each section contains commute, budget and itinerary as well as some recommended side trips like a trip to Ikea, etc. I am now down on my last twenty pages and I am sure that before this trip draws to a close, I will again be breaking out a new notebook to serve me on future trips both locally and outside the country. In this day and age where everything can be found in just a few clicks in our smartphones and iPADs, you might ask me why bother writing it all down in paper. I don’t know, but for me — there’s a certain “order into things” whenever I summarize all the information out there and write them (in order). It gives me the sweet sense that I am going somewhere and that I have truly prepared for it. The same notebook serves as a reminder of the things I’ve seen, the things I’ve enjoyed and the “not-so-much”. The writings, no matter how hurried or out of place some of them may seem, hold a certain gravitas and memory. After a few months or so, you will look back and remember that great food you have somewhere on the backstreets of the city; or the number of the hostel you booked online and forgot about. 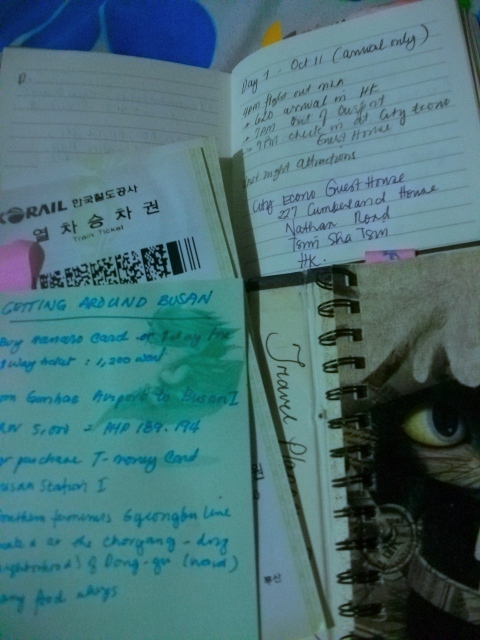 People buy keepsakes of their adventures, I tend to write them down. To me, all great journeys-good and bad memories-begin with a single stroke of a pen.